The best way to think about this is as a trail mix in bar form. Nice amount of calories for the weight of the bar. A little sticky so watch your hands, but chewy and you can really taste the fruit and nuts. Has that "all natural" taste as it's advertised, which may be considered a bit bland to some. I think it's a great trail snack and everything in between. Got this from Trailspace as part of a Reviewer of the Month prize package. I’ve seen these around, but have only recently tried one. They’re available in warehouse clubs as well as local grocery stores. I’m always looking for good tasting snacks. I eat your basic granola bars everyday as a snack just before working out, but this KIND bar filled me up more (comparatively) than the granola when I ate it during a day hike. 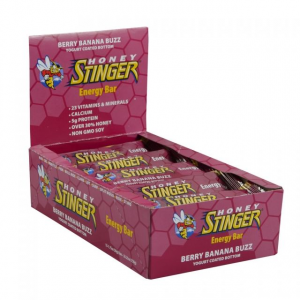 It does have a very natural taste, like I said, it is just like a handful of trail mix put together in bar form using what seems to be some sort of honey/apricot paste. While it does taste natural, it isn’t overwhelming sweet or nutty. To each, their own if they want a bar with that sort of profile or not. While it doesn’t say on the front of the bar, this does have coconut in case you're allergic. The nutrition facts and ingredients are below. 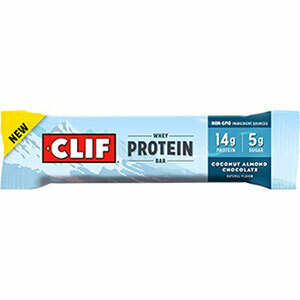 Hits some of the high points for me with calories (typically I like to get more than 100 calories per 1 oz and this is 190 calories for 1.4 oz), as well as 5g fiber and 3g protein. The almonds don't give it an overly nutty taste. The same can be said of the apricots, not excessively fruity. There's a good balance of fruit to nuts. 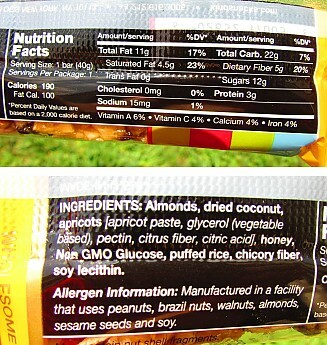 The bar's advertised as all natural; from the taste, ingredient list, and appearance, it seems appropriate. It is pretty sticky though, even at room temperature. Just eat it straight from the wrapper. Not anything new, I think we all kinda expect that from bars like this. No prep needed and it is handheld so it'll fit well in a packs hip pockets. The actual chunks of almonds and fruit can actually be tasted as opposed to it being so processed the ingredients can't even be separately identified (or tasted). I have had many PRObars while on the trail, which are pretty expensive but they are loaded with some great flavors (from mint to peanut butter to fruit) and nutrients. 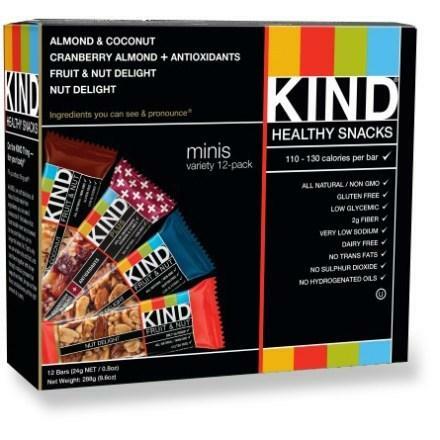 With those bars being around $30 for a 12 count, the KIND are available for $14-$16 for a 12 count. The thing is, these can’t be compared apples to apples because PRObars have about twice as many (or more) calories and nutrients. One would need two 1.4 oz KIND bars to match what’s provided in one PRObar. When looking at a price comparison they would just about be the same (24 count KIND, 12 count PRObar). It all comes down preference on flavors and portion size desired. I enjoyed the bar. 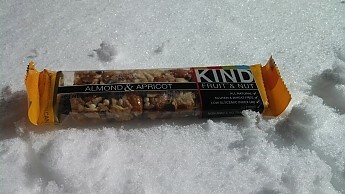 The apricot and almond taste may be plain, but I think the natural ingredients and nutrients from the bar make up for it. It'll go on my "good snack" mix next time I need to stock up on bars for a trip. Thanks for the review, I'll give these a try if I can find them. Not too sweat sounds good to me. You know, this review got me thinking about experimenting with making my own. That's actually a great point, G00SE. I think it'd be easy to get some trail mix and use some sort of binder; I've come across a melted peanut butter and honey combo that can be used. Throw some mini M&Ms in there and you've got yourself bar! A lot of the all natural ingredient bars that I have tried here in Japan are really mostly just a paste of dates and mashed nuts. I've seen recipes for them that are also mostly just that. You might not need any extra binder. Nice review. They were handing these out at a race I did awhile back. I grabbed a few but still haven't tried them. I'll make it a point to try one on my next trip. I really like the Probars too. So let me start by saying, I'm not knocking this product. I definitely think it is worth a taste test of your own. I was simply disappointed as the experience did not live up to the anticipation. I love almonds. I love dried apricots. Using honey instead of sugar is a great choice. All the components should have lead to an unbridled party in mouth. Yeah, baby! I lay out my sit pad, plop down onto the snow and dig into my lunch bag. Conversation is lively and full of laughter. I'm having a great time. Then I glance down at my hand and noticed I've already eaten half the bar. What? When did that happen? I've been savoring the opportunity to try this bar, and I don't remember the first half of it! So I took a more thoughtful bite and found it bland and uninspiring. It didn't taste bad. It certainly didn't didn't taste gritty or give the impression of sawdust soaked in wood glue. It was just forgettable. It was also not very filling. A short while later I was happily hiking down the trail munching on an apple, enjoying my day, but disappointed with this Kind Bar. In summary, should anyone ever offer me one again, I'll gladly eat this healthy snack. However, I won't be buying one for myself (unless my only other choice is a sawdust bar). I agree, I wouldn't choose these to fill me up and propel me up a mountain. 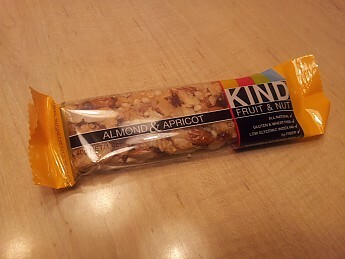 But, one reason I like Kind bars is because they're not as calorically large as many energy bars, so for me they're a good option for some light calories. I eat the chocolate/sea salt and chocolate/peanut ones. In two words? Freakin' delicious. In more words than that? 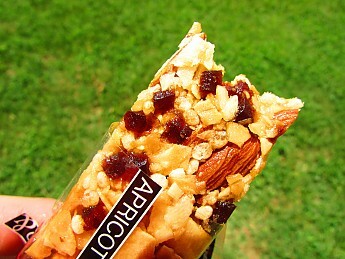 A fruit and nut bar that is exactly that: sizable and fresh-tasting fruits and nuts. Special guest appearances by honey and puffed rice add further texture and crunch you won't find in a CLIF bar. I'm a meat-and-potatoes kinda guy, and this bar may actually get me to eat my fruit. Yep. That good. Boy, am I on cloud nine. Recently I won the monthly raffle drawn from submitted reviews, and I knew I was getting an AAC membership and a Mountainsmith pack. Well, Trailspace did me one better, and promised to send me an official cap to wear on the trail. More free stuff? Can't complain about that. More things not to complain about? Well, turns out they packed me a lunch, too: included inside were a couple snack bars. This was one of them, and my favorite of the two. 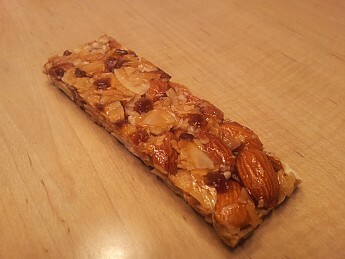 I sampled the "Apricot and Almond" flavored bar. I like the fact the wrapper is transparent and see-through, so if I was in a store, trying to decide between items, I could easily judge for myself what is in this bar and how appetizing it looks. I think this is something more manufacturers could (or could not) benefit from. Their honest, straightforward approach is much appreciated. "Flavored" is probably a poor way to put it, because — as advertised on the package — this bar tastes like these because it's filled with chunks of them. Whole almonds and meaty chunks of apricot. These make up the majority of the bar, and the filler is simply binding agent. Think of it like a well made crab cake: mostly whole, premium chunks of the meat, with the other ingredients serving the main ones, and keeping them together. Nothing more. The apricot makes for an interesting flavor profile. The first thing to hit you is the sweetness, followed by the accompanying tartness of an apricot. Sweet because the fruit is actual fruit and the flavor that comes with it. The apricot paste (and the honey) make this a sticky bar to handle, and I'd suggest leaving it in the original wrapper when you pack it with you. That, really, is the only negative thing I have to say about this bar. Made in America. If you like freedom, bald eagles, and really flavorful trail food, you'll love this bar. Support the American economy and pick one up. At home, I like salads more than any other dish. You can put an entire food pyramid in a bowl, and there's so, so much texture to make every bite interesting. 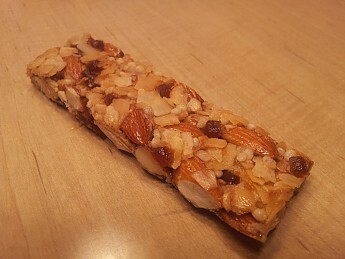 This bar is much the same, containing: Almonds, Dried Coconut, Apricots, Honey, Puffed Rice, and Chicory Fiber. Loved the texture, and the first bite was as good as the last. It's in a freakin' wrapper. No prep to be had. Trailspace probably figured I'd pack these away for a trip, but as it was, I just got home from a long driving commute and hadn't yet eaten dinner. This bar definitely took the edge off, and at 190 calories, wasn't something I was going to regret or have to work off later. Gluten and Wheat-Free (perfect for my gluten-intolerant girlfriend). Has a Low Glycemic Index (48). Non-GMO and No Trans Fats. I shared this bar with a couple friends because I was that impressed by the flavor. How many other bar-makers out there are confident enough in their products to put them in a clear wrapper? That fact alone speaks for this product, and now I do, too. I think I may have to pick up a box of these things if I'm able, because they're that good. I liked these so much, I went out of my way (literally, 45 minutes to REI) to pick some more of these up for my first solo backpacking trip. I'm not a breakfast eater, and CLIF bars sit too heavy on my stomach, so I needed something lighter. Mind you, at around 180 calories (give or take) each, one isn't a meal by itself. I packed a couple to take with me. I didn't want to have to bust-out a cook set to make myself lunch, nor did I want to wait for water to boil or food to rehydrate. More importantly, I wanted something that would taste fresh. My other meals were freeze-dried, which meant I was going to be taking in a LOT of sodium. Sure, I'd have the chance to hike a lot of it off, but I do have high blood pressure and do have to be mindful of my intake. These bars are great because I can eat one, or even several, and not worry about the sodium content. I put these together in one of my mesh hip belt pockets. Well, it was sunny and 80 degrees outside, which meant I was pretty warm and sweating quite a bit. 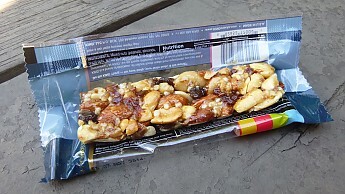 HOWEVER - for warmer weather, the "Fruit & Nut" line holds up much better than the "Nuts & Spice" line, because it avoids the inclusion of chocolate. "Dark Chocolate Cinnamon Pecan" sounds more like a fall snack, anyhow, doesn't it? So, after putting in several miles already, I stopped at a shaded pavilion, took off my pack, and unwrapped a couple of these. 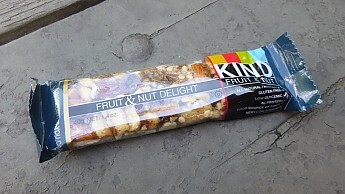 The other KIND bar was a "Nuts & Spice" bar, and has its own review, accordingly. Exactly as the name suggests, this one's primarily fruits. And nuts. No deception to be had, here, and even if you're doubtful after looking through the clear packaging, you'll be convinced after a single bite of this bar it's the real deal. 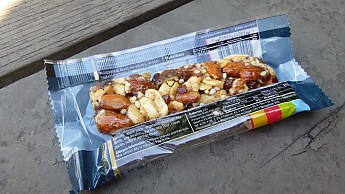 Peanuts, Almonds, Brazil Nuts, Walnuts, Raisins, Apricots, Dates, Honey, Puffed Rice, and Linseed. You can see it for yourself, you can taste it for yourself. This, just like the other one, had a great variety of texture. As much as I love almonds, it was nice to have a variety of mixed nuts this time around, as well as a couple other fruits to add to the mix. It really awakens the taste buds and every bite is as enjoyable as the one before it. I didn't suffer through the first one of these I had, I didn't suffer through this one, and I have yet to grow any bit tired of these. Especially after working up an appetite, these REALLY hit the spot. I don't like to hog-out while I'm being active, so this was a perfect way to get some calories in me while still being able to enjoy them. As convenient as gels and chews are, sometimes it's nice to know you're eating actual, honest food. First thought through my head after finishing the second and last one I brought with? Turns out they come in 12 packs. Good news for me. Bad news for the REI stockroom. Unlike the "Nuts & Spice" bar, this hadn't any chocolate, so aside from being a little soft and pliable, it was perfectly fine and otherwise unaffected by the heat. Don't forget to throw it out, or pack it out! 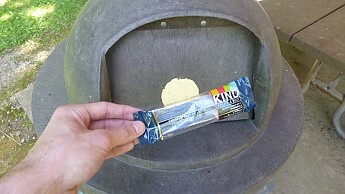 Any time I passed a trash can on the trail, I was sure to empty whatever trash I had on me. It worked out really well, and even though I had to hike a mile out and another back, I never once had to worry about carrying food packaging on me. How did it do on the trail? Was the weight proportionate to the number of calories delivered? Did it provide sustained release of energy? 190 calories isn't very much - how many would you need to make a meal? I've tried many different brand of bars gluten free. I've tried many different brand of bars gluten free. The Kind bars are god, texture is great, and they sustain you for a while. They are available at supermarkets and price tag is low. Great GF bars, unexpensive, tastefull, avalilable anywhere. Can't ask for more! The Kind Fruit & Nut Bar is not available from the stores we monitor. It was last seen August 25, 2018	at REI.